NOTE: In March 2011 ESA announced a new way forward for the L-class candidate missions: IXO, EJSM-Laplace and LISA. At this time the IXO concept ceased to be a candidate and ESA, along with the scientific community, is now investigating to what extent a European-led mission could preserve the original science case of IXO. The new study is called ATHENA (Advanced Telescope for High ENergy Astrophysics). For more information about the ATHENA mission please follow the link in the left-hand menu. The International X-ray Observatory (IXO) is a collaborative venture between NASA, ESA and JAXA, which is under study for launch in 2020. Initial design studies have been performed in ESA's Concurrent Design Facility (CDF) at ESTEC with the support of ESOC and by NASA's Mission Design Laboratory (MDL) at the GSFC. This article describes the mission operations concept that has been derived by the ESA studies. IXO will have a launch mass of around 6600 kg and will be about 10 metres long and 4 metres in diameter in its launch configuration. The nominal mission lifetime is five years, with consumables sized for 10 years of operations. 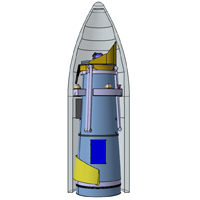 IXO stowed in an Ariane 5 fairing. IXO will be launched on either an Ariane 5 ECA or Atlas V 551, with direct injection towards a large-amplitude halo orbit around the second Lagrange point (L2) of the Sun-Earth system. The main advantages to this orbit are a very stable thermal environment and minimal shadowing by the Earth or Moon. The journey to L2 will take just over 3½ months. IXO's orbit has been designed to be eclipse-free during the transfer and for at least the nominal mission lifetime of five years. No deterministic manoeuvres are required. However, correction manoeuvres are needed to compensate for the dispersion of the injection state vector caused by launcher accuracy limitations. After the injection by the launcher, two days will be needed for obtaining tracking data. This time will be also be used for initial spacecraft commissioning. Two days after injection, a correction manoeuvre will be performed. Sufficient Δv budget has been allocated to allow a fixed launch orbit, simplifying the interface with the launch service provider. More tracking will be needed after this first correction, which will again be performed in parallel with operational activities. A second correction manoeuvre will be performed 10 days after injection. The deployment of the instrument module can take place following the day-10 manoeuvre, after which the remaining spacecraft commissioning tasks will be performed. IXO's operational orbit about L2 has a semi-major axis of 800 000 km. No insertion manoeuvre is required. 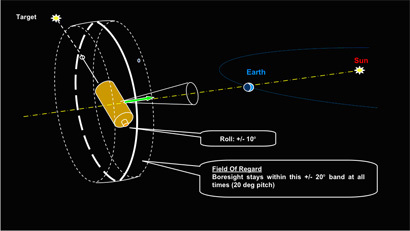 In the selected L2 orbit, it is possible to always have the same side of the spacecraft nominally pointing towards the Sun. However, to increase the instantaneous coverage of IXO, the spacecraft has been designed for a pitch angle of up to 20 degrees. Therefore, at any time the IXO telescope can access a 40-degree wide wedge of sky at all ecliptic latitudes. In addition, the spacecraft has been designed to enable a roll angle of up to ± 10 degrees, so that the observation conditions for the X-ray Grating Spectrometer (XGS) instrument can be optimised with respect to avoidance of off-axis sources. In the ESA concept, routine communications between IXO and Earth could be via a single ESA ground station, nominally the 35-metre antenna at the New Norcia station in Western Australia. The Cebreros ground station in Spain will be used if the spacecraft elevation is too low or the weather is too bad at New Norcia. Communications with the spacecraft will be possible for about three hours per day, with a telemetry data rate of 8.7 Mbps allowing 90 Gb of data transfer per day. The spacecraft's mass memory will be sized to store science data from two days of observations at the highest data rate, in order to be able to cope with a failed telemetry downlink sequence.